Join us for this educational program at the Graffiti House (Click for directions.) The event, including a tour of the historic house, is free. Donations to support the restoration activities are greatly appreciated. The Fairfax Rifles (the 17th Virginia Infantry Regiment, Company D) and the Little Fork Rangers (the 4th Virginia Cavalry, Company D) are establishing camps at the Graffiti House where they will demonstrate the lifestyle of the Confederate soldier who fought in the Civil War. Throughout both days, skilled re-enactors from the Fairfax Rifles (Click to visit their web site.) will demonstrate how the typical soldier in the Army of Northern Virginia was uniformed and equipped. Educational programs will feature drill demonstrations, musket firings and talks about field cooking and the camp life of a Southern soldier on campaign. Their ladies, dressed in authentic costume will accompany the Fairfax Rifles. 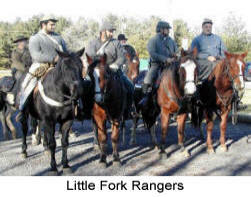 In addition, the Little Fork Rangers from the Rixeyville area will ride their mounts over to Brandy Station and set up a cavalry camp. These Confederate cavalry re-enactors will demonstrate the experiences of soldiers who participated in J.E.B. Stuart’s “Grand Review” and the June 9th, Battle of Brandy Station in Culpeper County. The living historians will perform authentic drill maneuvers on horseback and demonstrate the equipment that a cavalry soldier would have used. Free tours of the historic Graffiti House will be conducted all day. During the Civil War, this house was used extensively by both the Union and Confederates armies. After the great cavalry battle at Brandy Station on June 9, 1863, the house served as a Confederate hospital. Later, Federal troops occupied the building when the Army of the Potomac camped in Culpeper County during the winter of 1863-64. The plaster walls on the second floor of the house are covered with an outstanding and unique collection of charcoal and pencil graffiti left by soldiers from both armies. For more information call 540-727-7718.